Whenever I cook for a party, marinated mushrooms are inevitably on the menu. I make them lots of different ways – mysteriously spiced with cinnamon, seasoned with various herbs (I especially like them with tarragon), and here, a sweet-sour version. These mushrooms are lightly poached in a balsamic vinaigrette with plenty of herbs. Before serving, drizzled them with saba. 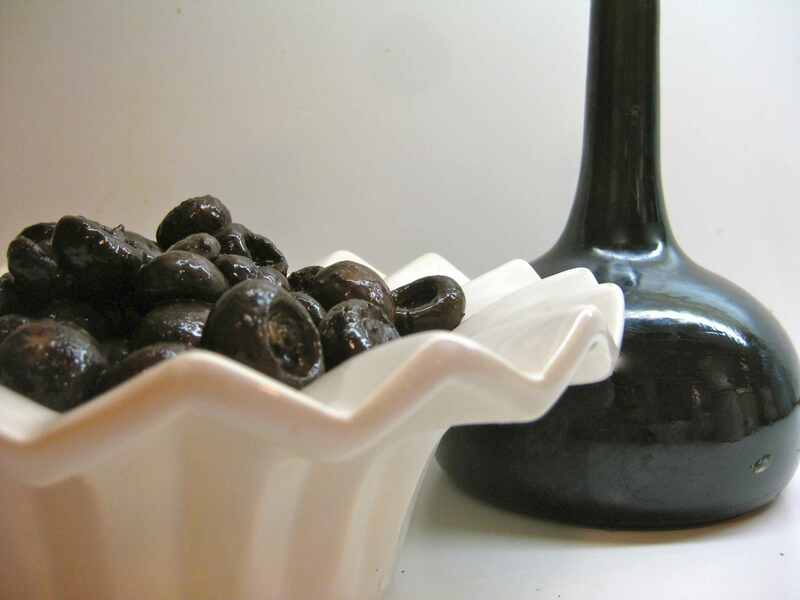 Saba is a syrupy reduction of grape must (made from skins, seeds and flesh of the grapes) and comes from northern Italy. There are Spanish versions too. Mixed with a little balsamic vinegar, it adds an interesting depth and sweetness to the marinated vegetables. Saba was very popular in stores a few years ago. It’s used sparingly so if you buy too big a bottle, it will surely be a lifetime supply (like mine). My bottle’s so picturesque that I just like having it around Since I just resurrected it from the back of the cupboard, I have a few plans for it. . The syrup is amazing drizzled on blue cheese or on roasted carrots. The recipe comes from Paula Wolfert’s Slow Mediterranean Kitchen. I changed her proportions considerably, dramatically reducing the oil. I used tiny local cremini mushrooms from eastern Pennsylvania so I didn’t need to slice them for the salad or quarter them for the appetizer. 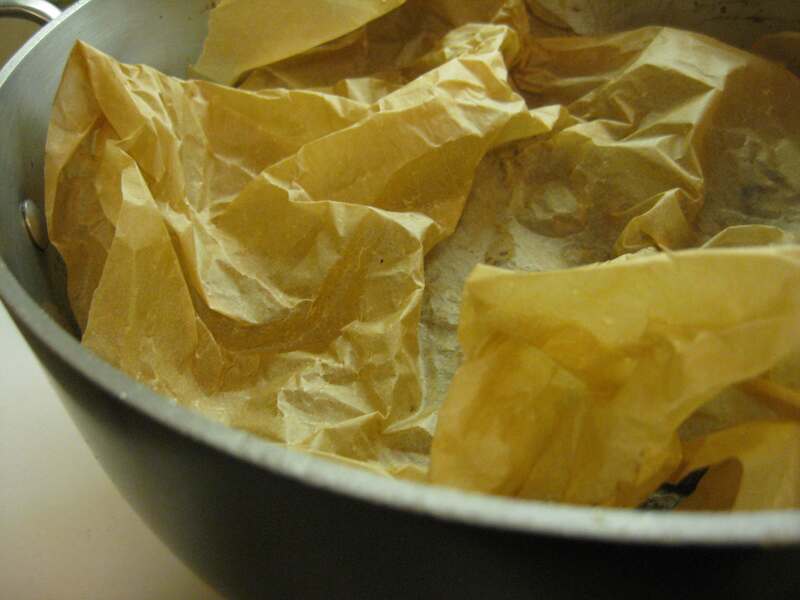 One great trick that she uses (as does Christine Ferber, the French doyenne of jam) is crumpling parchment paper on top of the simmering (or in Ferber’s case, curing) ingredients. This holds in the heat but doesn’t make the dish steam as it would in a covered pot. Great technique. The mushrooms improve with age, so make them a day or so before serving. In addition to being served as an appetizer, they mushrooms are terrific in salads and as condiments served with meat or poultry. 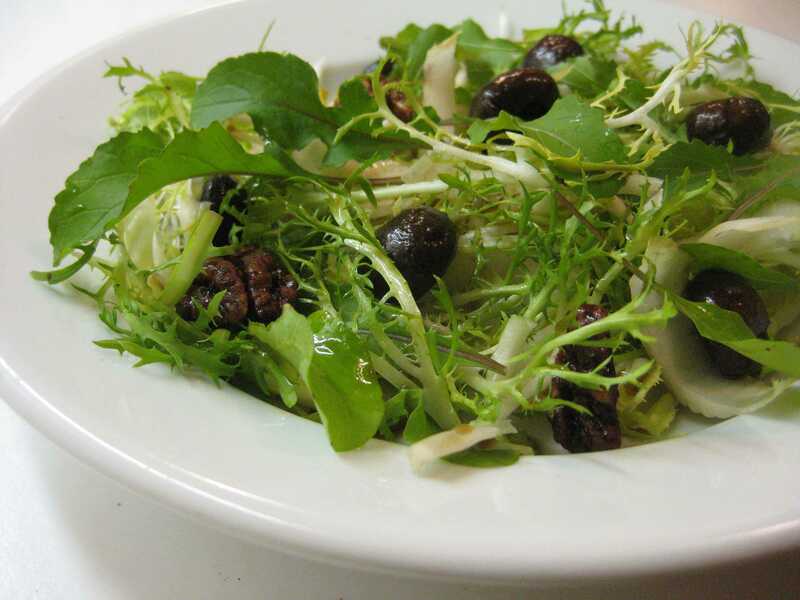 I loved this salad of frisee and sliced Belgian endive with baby arugula from my garden, garnished with the mushrooms and some walnuts. The mushrooms’ marinade made a slightly sweet dressing for the bitter greens, perfect for this time of year. 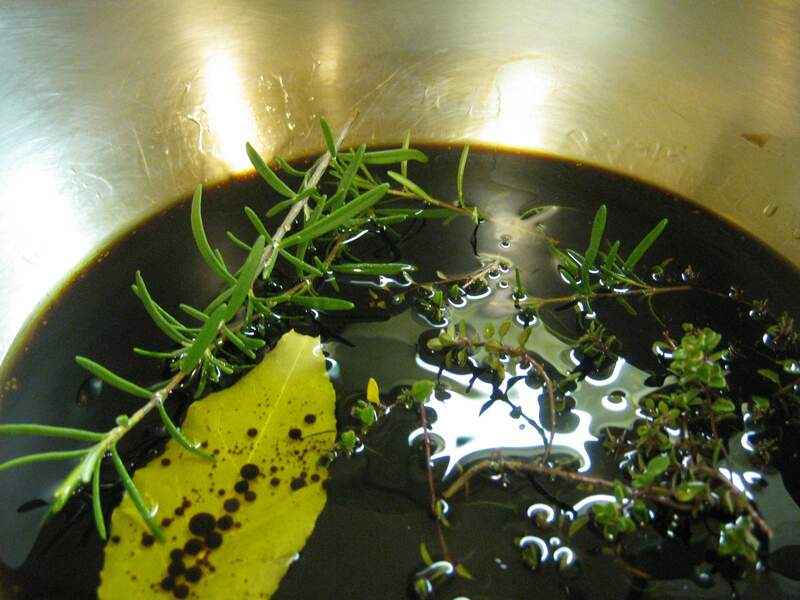 Bring the olive oil, vinegar, herbs, honey and salt and pepper to a boil, add the mushrooms and bring the liquid back to a boil. Turn down the heat. Crumple a piece of parchment paper on top of the mushrooms and let them simmer for 5-8 minutes depending on the size of the mushrooms. Remove from the heat and let stand for an hour or so until they reach room temperature. Refrigerate for at least a day. When ready to serve, drain off the liquid (you can use save it to use as a salad dressing with the addition of a little more olive oil). Toss with the saba and serve as an appetizer with toothpicks. The mushrooms keep for 3 days or so and are best on the second or third day.